Standing: Pa' Gray, George Houston, ?, Jimmy Mitchell, ?, Leslie Reid, ? 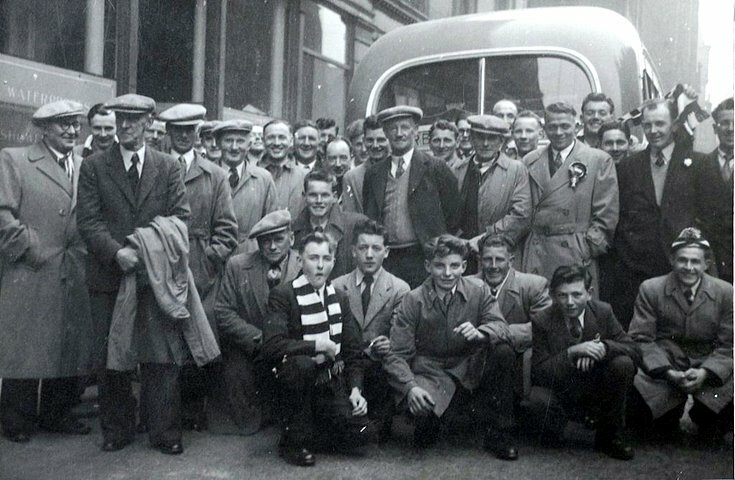 McDonald, George Henderson, Dod Stewart, Sandy Beaton, Billy Balfour, Arthur Nichol, Wullie Davidson, Charlie Spence,(The Brig bus driver) Sandy Fraer, ?, Archie Nichol, ?, Bill Joss, Dod Laing, Harvey Kelman, Harry Laird, Ed Ellis, Bill Mackie, Sandy Fraser jr, Georgie Laird. The McDonald is Sandy, and he came fae Mon'gerrie. Who are the two faces directly behind George Houston wi the bonnets and the the one to Bill Joss's right?